American Players Theatre veteran Tracy Michelle Arnold inhabits the reclusive poet Emily Dickinson in "The Belle of Amherst." On one of Spring Green’s main drags — not far from the Arcadia Bookstore, one of the town’s social/intellectual hubs — there’s a little place called The Jefferson. Formerly a sports and NASCAR bar, it’s been known in its various lifetimes as everything from the Silver Poodle to Grumpy’s and Red’s. Now, thanks to Robert Doyle and Bryan Byrnes, it’s something else entirely. It’s the home to a new winter not-for-profit theater company called Two Crows Theatre. Last weekend, the company debuted its second show — a one-woman performance of “The Belle of Amherst,” a play about the reclusive poet Emily Dickinson, starring American Players Theater Core Company member Tracy Michelle Arnold and directed by fellow APT Core Company member Colleen Madden. As he walks around the still-evolving space, with its knotty pine posts and 1900s-era exposed brickwork, Doyle, the company’s artistic director, and Byrnes, his artistic associate, talk about the “great opportunity” The Jefferson represents. “We wanted it to be a speakeasy,” says Byrnes, a longtime actor, playwright and fight director who filled the latter role for APT in 2017. The front room bar, named Rosa Lee’s Lounge in honor of Byrnes’ grandmother, reflects that. The back room that used to host bridge tournaments and community events, is now a black-box theater seating up to 82 people in a thrust-stage arrangement. It’s currently decked out as Dickinson’s’ living room and bedroom. Doyle, who hails from Long Island, New York, is no stranger to theater startups. Two Crows is his third. His first came to Spring Green in the summer of 2014 to take part in APT’s apprenticeship program. (He also came back and did fight work with Byrnes at APT in 2017). The company’s name comes from “One for Sorrow,” the classic poem Doyle’s mother, a music teacher, used to recite to him when he was a child. (Madden points out that the original British version features magpies, not crows. “Close enough,” Doyle quips.) The company’s logo is a pair of crows in aspects that represent comedy and tragedy. The motif even shows up In “The Belle of Amherst,” where the sounds of birds chirping outside Dickinson’s family home is occasionally interrupted by the caw of crows. Having once turned down the role of “Belle,” Madden views the play as both a second opportunity and an unexpected first. It’s her debut as a director. She says she’s had a blast exploring the links between science and spirituality offered by the script. And the character also fascinated her. As Dickinson, Arnold’s at her best, leaning into the poet’s eccentric genius vibe. Their schedules actually gave Arnold an advantage. The two women rehearsed together for two weeks before Madden left to work on “Heisenberg,” giving Arnold a chance to get into the character of Dickinson on her own. Madden was working on “Belle” during the day and performing “Heisenberg” at night. Their friendship also made the process smoother, Arnold says. “To work with someone who you’ve already developed a trust and shorthand with is a massive advantage,” she says. APT’s already proven there’s a local audience for theater-based entertainment in the frosty depths of February and March. The company’s Winter Words staged reading series often sells out in advance, depending on the play. Doyle and Byrnes are obviously hoping to capitalize and build on that. They plan to run plays through April, augmenting the space’s schedule with live music events. Madden notes that Two Crows fits a trend to bring art into smaller communities. “In a place so subject to seasonal challenges, it’s great to have something to do,” she says. “To be able to do different kinds of work in our hometown and not have to leave our children is huge,” Arnold says. Madden admits that directing a play about a poet who rarely left the confines of her father’s Amherst home has her thinking about the parallels to Spring Green. Doyle’s conscious of the many ties between his company and the larger one a few miles to the east. (“We’re like APT Lite,” Doyle jokes.) And although the Two Crows show next month also features a single APT actor — Arnold’s spouse, Marcus Truschinski, appearing in “Someone to Watch Over Me” — shows with multiple cast members who aren’t APT vets will be part of the ongoing plan. Doyle already has shows in mind for the second season. Doyle says he learned a ton of technical tricks from APT production manager Michael Broh and the company’s lighting experts. The white period dress Arnold wears was borrowed from APT. But the rest of the props, from pristine tea sets to a wooden trunk, were either borrowed from Madden and Arnold or bought at thrift stores. "The Belle of Amherst” runs through Saturday, Feb. 16 at The Jefferson (137 West Jefferson St.) in Spring Green. For ticket information, click here. 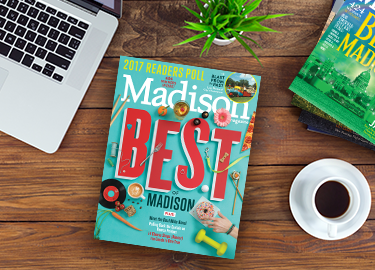 Aaron R. Conklin writes his award-winning coverage of the Madison-area theater scene for madisonmagazine.com.